The role of Florine, played by Patti LuPone, is not in the original play "Driving Miss Daisy". It was written in by playwright and screenwriter Alfred Uhry specifically for LuPone, who, Uhry felt, looked good in a costume. Incorrectly regarded as goofs: When Hoke is in the phone booth outside of the "Piggly Wiggly" you can see a theatre in the background. The movie on the Marquee is "Scudda Hoo! Scudday Hay!" This was not released in 1953, it was released in 1948. It would not have been in theaters for over 4 to 5 years. (You can see the year that has passed when the Christmas Scene showing the cards starts at around 0:40:43 in the movie. )Boolie hired Hoke only six days before this scene ("The same time it took the lord to make the world"). In addition, when Hoke and Idella are in the kitchen talking, the announcer on the radio mentions that the year is 1948. By the time of the cemetery scene, the year is 1951. Daisy Werthan: I've never been prejudiced in my life and you know it. Boolie Werthan: [about the Martin Luther King dinner] Okay, then why don't you ask Hoke to go with you? Daisy Werthan: Hoke? Don't be ridiculous. He wouldn't go. Driving Miss Daisy is an unusual film. Although it's really more of an extended pair of entwined character portraits--spanning a quarter of a century--it has all of the narrative focus and tightness of a more traditionally structured mystery plot. 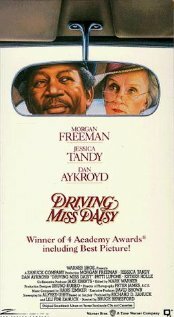 The character portraits are of Daisy Werthan (Jessica Tandy) and Hoke Colburn (Morgan Freeman). The film is set in suburbs of Atlanta and begins in the late 1940s or early 1950s. Daisy is wealthy, but she wasn't born that way. Her son, Boolie (Dan Aykroyd) runs the successful family business--a large textile factory. At the beginning of the film, we see Miss Daisy, who is already around 60 years old or so, have a driving mishap--she has the car in the wrong gear and runs off of her driveway, almost completely backing over a 10 foot drop to the neighbor's driveway, at about 20 miles an hour. This naturally concerns Boolie, and when Daisy has a problem finding a company that is willing to insure her after the accident, Boolie hires Hoke--also rapidly approaching "elderly"--as her driver, against her protests. She doesn't want a driver. She doesn't want someone else in her house. She doesn't want to be treated as if she's incapable. Driving Miss Daisy is an exploration of Hoke and Daisy's relationship, all the way into the early 1970s. Alfred Uhry adapted the script from a play he wrote by the same name that was first produced Off-Broadway. Although the play began in a small theater, it had good reviews and good word of mouth, necessitating a move to a larger theater. Uhry eventually won a Pulitzer Prize for his work. He has said that that Driving Miss Daisy was semi-biographical about his grandmother and her driver. 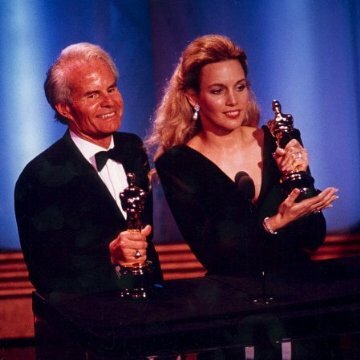 That fact probably helped create the remarkable depth of character shown in the film, although certainly director Bruce Beresford, Freeman, who also starred in the play, and Tandy do more than their share to build a charming, frequently funny and poignant portrayal of two very different humans learning to see eye to eye. It's significant that Driving Miss Daisy is set in the South and spans the period prior to and slightly after the civil rights movement in the US. And it's significant that Hoke is an African-American while Miss Daisy is Jewish. Miss Daisy is humorously fussy, prim and proper. Well, to the audience at least--I don't suppose it would be so humorous to have to deal with it. This helps create an initial "formal antagonism" between Daisy and Hoke. Only infinite calm and patience from Hoke earns a gradual softening of Daisy's public displeasure and curmudgeonliness. The unusual structure means that Driving Miss Daisy is more a series of vignettes, each significant to the gradual coming together of Hoke and Daisy, although most incidents are relatively minor in isolation. Uhry makes the film a collection of those small but memorable, important and frequently amusing (at least in retrospect) moments that make up a lifetime of telling memories in any familial relationship--and Hoke does become family. Eventually, Hoke and Daisy form a bond that is perhaps stronger than Daisy's bond with her own son. As for the significance of Hoke and Daisy's ethnic orientations, Miss Daisy makes a vocal point of not being racist or otherwise discriminatory. She also likes to focus on her humble beginnings--a few incidents near the beginning of her relationship with Hoke hinge on her being embarrassed at her wealth. And of course, as a Jew in the South, she is well aware of discrimination and disadvantage, having experienced it first hand. One of the more touching scenes of the film features Hoke and Daisy driving to Alabama to attend her brother's 90th birthday party. It's Hoke's first time outside of Georgia. They've parked temporarily on the side of the road. Two white Alabama policemen see Hoke and pull over. They want to know what Hoke is doing with a nice, new Cadillac. When they discover that Daisy is Jewish, they are disparaging through implicature, and they make a literally discriminatory remark to each other when Hoke and Daisy drive off. Although these kinds of events are much more major than say, apparently stealing a can of salmon, Uhry and Beresford tie them together wonderfully so that they all have about the same significance. Related to these themes, the film is also charming and moving for juxtaposing a kind of personal consistency throughout time with a rapidly changing society. That's why the profound social changes happening "just next door", so to speak, are largely kept in the background. Technically, Driving Miss Daisy is a gem. It's full of subtly complex and aesthetically pleasing cinematography, well blocked scenes and a fabulous and deservedly famous score from Hans Zimmer. But the story and performances are so good that it's almost difficult to notice the technical stuff. Unless you are completely averse to anything even slightly in the realm of realist drama/light comedy, Driving Miss Daisy is a must-see. It's sentimental but not syrupy and touching but not overly serious--you'll laugh just as often as anything else. Don't miss this one if you haven't yet seen it.